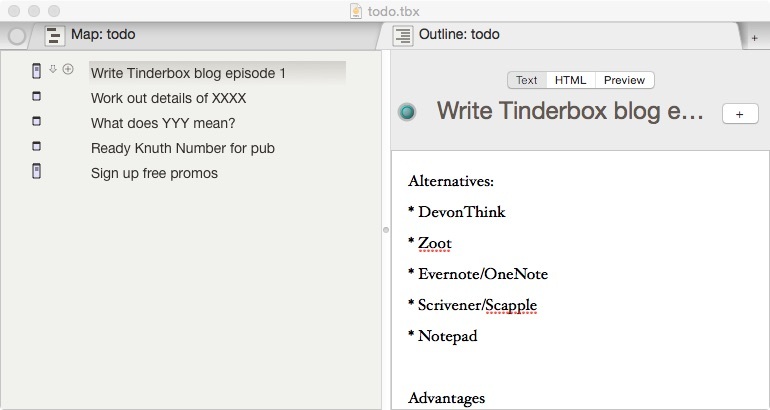 Home » tinderbox » Why Tinderbox? I’m putting together a series of blog postings on Eastgate’s amazing power tool, Tinderbox. I’ll cover the ‘what’ and ‘how’ in great detail, from the perspective of a writer/worldbuilder. But I’ll start with the ‘why’ in the form of a practical example. A friend recently asked me about a tool for outlining and list tracking. I immediately suggested Tinderbox, but the reaction was, roughly, “yeah, I looked at that once, and my brain still hurts.” I don’t think this is a good characterization, especially since TinderboxSix came out with a major usability rework. Creating a basic list/outline is even easier than, say, making a paper list. A few minutes ago, I was in the “busy-fret” state. You probably know this feeling. I have a cloud of things to do looming over my head, but I’m not even sure what all those things are. I know they are many, and they won’t wait. I need to be working on something, but I’m so preoccupied with this list in my head, I can’t stop long enough to concentrate on anything. Sound familiar? I need to capture this TODO list somewhere outside my head. With it committed into fixed format, I will be able to prioritize things and focus in on starting getting stuff done. And I know just the tool to do this. You can see in the right-hand column here some of the things I’ll be mentioning in a future blog post. And I lightly redacted a few other things for the screen shot, but you get the picture. So I was able to get to this point with very little cognitive overhead, and now I’m ready to plow on getting thigns done. Oh, and I jsut remembered one more thing on my list. I’ll add it now. I’ve used maybe 1% of the power of Tinderbox so far. Stay tuned. P.S. I’m using a wordpress category tinderbox for all these postings, so it’ll be easy to see them all in one place. If you enjoyed this, sign up for my low-volume mailing list for more tech tips + stories I write with help from Tinderbox.